Extraits de Orient sunbeams or From the Porte to the Pyramids, by way of Palestine, publié en 1882, Samuel Sullivan "Sunset" Cox (1824-1889). Cet auteur était membre du Congrès américain et diplomate (il fut une année ambassadeur auprès de l'Empire ottoman). “Much has been written as to this mystic god of the ancient cradle of civilization, the Sphinx which is the name for Egypt. I am puzzled to express my idea of it and its temple. We alight amid the sandy heaps, and look down into the rock-cut caverns, and up to the half-hid genius of the Unknown. The Sphinx is sunk in the lime rock. It is a part of it. The tombs about it are lined with immense granite blocks, laid in perfect courses, and with joints as true and handsome as any modern masonry. These blocks came from the cataract, 800 miles above. They form an antique cemetery, covered by forty feet of sand. The temple is thirty feet beneath the level of the sand. From it. a roadway, paved with white flagstones, leads up to the pyramids. They seem to have been connected, religiously. 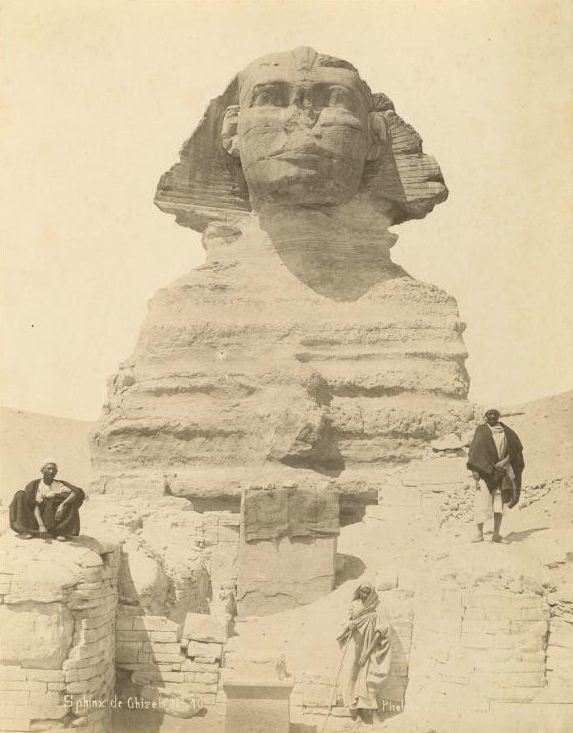 The nose of the Sphinx is broken or worn off. It detracts from his dignity. It is a mistake to call the Sphinx her. His head-dress is partly demolished. Once the head was crowned with the royal helmet of Egypt ; but his feet and form remain for solution. Let its Oedipus stand forth ! There is no satisfactory guess yet as to any of these gods of Egypt. Only one thing is surmised, that in the gods we see the men who made them. We read in their calm features aspirations after the other world Immortality ! The pyramids are resolvable into tombs, or, if you please, by a stretch of fancy, into astronomical edifices ; but this Sphinx has been from the earliest days as much of a dumb enigma as the protoplasm. An intelligent and metaphysical writer, who was here, regards the Sphinx as more wondrous than the pyramids, because so awful and lonely. He even finds comeliness in the thick lips of the Sphinx, and regards him as a forgotten mould of beauty. To my thinking he or it is simply a monster, begotten of the wild imagination of a sunny people, who, after running out of the animal creation for their deities, framed this miscreant. It is said to be an image of the Deity, because unchangeable, having the same will and intent forever ! But it has changed. It is not inexorable. It is dead rock, and subject to mutilation and wear like any other piece of limestone.